Lightning and surge protection are two separate systems. For complete home coverage, we recommend a six point system which includes the Preventor for structural protection along with a Total Protection Solutions (TPS) surge protection system, and a single earthing/grounding system. With over 25 years experience in the Florida market, we have researched the range of surge protection devices and lightning protection products available. We selected these reliable UL and ARL listed products as the most appropriate components for the residential systems we design and install in Florida. They are two of the three components included in a safe, low maintenance, and cost effective system to protect your home. And all of the products we use are made in the USA. This Sarasota homeowner learned first hand how important lightning protection can be when you live in the lightning capital of the US. The Preventor protected her home and made her a believer. Our complete lightning protection system utilizes an Early Streamer Emission (ESE) terminal, The Preventor 2005, as the structural lightning protection device. The air terminal is installed in conjunction with appropriate surge protection devices and carefully designed earthing/grounding. A single Early Streamer Emission device can protect up to 300,000 square feet. The Preventor is installed on your home using down conductor(s) and a grounding system. This aesthetically pleasing system is virtually invisible, with minimal roof penetrations and less roof mounted equipment than other alternatives. Featuring an ionizing air terminal, the Preventor is a technically advanced, contemporary alternative to traditional lightning rods. 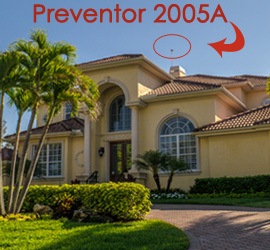 A single Preventor 2005 can protect up to 300,000 square feet depending on architectural features. A second model (2005A) is available for smaller homes or for specific architectural designs. Capture the lightning strike to a preferred and known point. Convey the strike to ground in a safe manner through a known route. Protect all power lines entering the structure from transients and surges. Protect all incoming data lines and signaling lines from transients and surges. Eliminate Ground Loops with a single grounding system and low impedance earth network. We are your local lightning experts, and we hope to have the opportunity to add your name to our long list of satisfied clients.